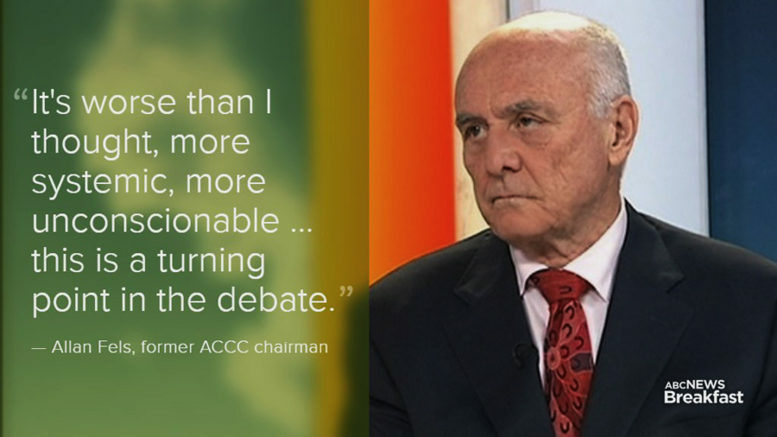 Founding chairman of the Australian Competition and Consumer Commission (ACCC), Professor Allan Fels, has slammed the Australian Securities and Investments Commission (ASIC), and accused it of being a toothless tiger, when it comes to dealing with the misconduct of the banks. This is the body that is supposed to have the powers to deal with the matter. Allan Fells, whose comment was broadcast on the ABC’s AM program, makes a good point. He also proposes that the powers be stripped from ASIC and handed over to the ACCC, under the belief that it is more likely to take on wrongdoing. At least it couldn’t be worse than it is now. Fells suggested that “…fierce lobbying by the financial services sector meant that the ACCC did not get given the coverage,” when supervisory powers over banks were being considered in the late 1990’s. There is no doubt that this was true, and the rest is history. Now that mountains of damaging information are coming out of the financial services royal commission, regulation is coming up in the debate again. Allegations of criminal conduct have been made some instances. For example, the National Australia Bank (NAB) has been accused of charging $3 million in fees to dead people. Many more allegations involve sub-standard service and the fleecing of customers. Allan Fells also backs the Green’s proposal for the breaking up of the banks to counter their existing monopoly. The proposals have some merit and should be considered as part of the solution. Nevertheless, on their own, they are unlikely to make little difference. The behaviour of the banks and other major financial institutions is not merely a problem to be tackled by tinkering with the organisation or the supervision and company structures on paper. Nor is this behaviour the result of a few rotten eggs. The problem is systemic and without a systemic approach, everything will remain as it is. Systemic means the functions that the banks and other major financial institutions play in the economy and society. Their most important function is that they collect a pool of investment funds from the whole of society and make it available for doing business. Through this the financial system is integrated into the whole economy. In these conditions, the banks and other major financial institutions do not operate to meet the needs of society, but the needs of the corporate world. And the associated business of networking in the highest of places, lobbying and making financial contributions, ensures that corrupt practices are a normal part of operations. If Australia wants to put an end to the present situation, the financial system must be changed, from one primarily existing as the head of a corporate cartel, to system where the needs of society as a whole are met. Control over finance must be taken from the cartel, and it must have a different role to play. the pool of investment capital must be turned over for appropriate use for the whole economy. The financial system must also have a vital social role, redistributing wealth in the direction of the average citizen, operating as an enabler to meet the individuals and society’s goals. Regulation and supervision are needed to achieve these ends. The difference is that this is not regulation and supervision for the sake of regulation and supervision , but regulation and supervision under guidelines to meet specific targets. This would be helped through the creation of a public banking system. Such a package is far more likely to be effectual. The present danger is that with the fall out from the financial services royal commission, the political process will settle for a few cosmetic measures, and may even sacrifice one or two individuals, and cover up that nothing of substance is really being done. 2 Comments on "Misconduct by banks and other financial institutions will not be stopped by tinkering at the edges"
The banks make up the core of our economic system and that core has been found to be rotten. Tax avoidance, the cash economy, stolen wages, stolen superannuation, crime both organised and diffused are now the norm throughout our economic system and it is the ordinary, powerless citizen who pays. Capitalism is eating itself from within and will inevitably collapse. What then? Thats not actually all. I became involved in what is effectively a criminal spy network using technology to actually predict WHO you meet in the next 15 minutes. A significant proportion of these people had careers in Banks, Corporations and even the BBC (and many others). None of them worked for MI5. It is also global with a very well definded methodology and an ideology steeped in Elitism and Symbolism. The symbolism is evident in the mountain of subliminal messages they love to send to victims. They specialize in leaving no evidence of their activities and are behind numerous murders over the decades. Its time to take out the trash.